BeautyFruityBlurbs: COMPETITION: ELAN SS13 LAWN GIVE AWAY!!! 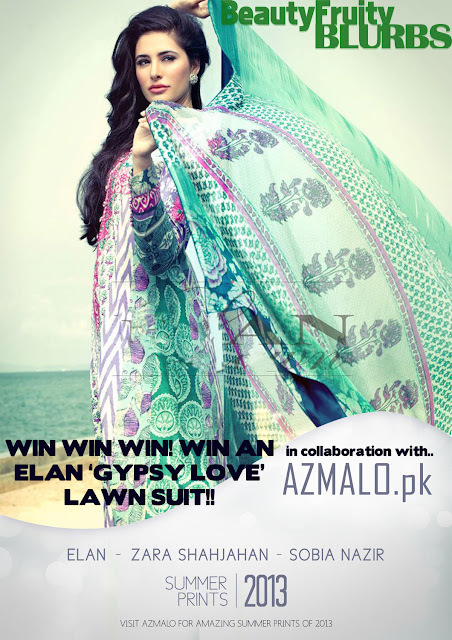 COMPETITION: ELAN SS13 LAWN GIVE AWAY!!! Here is your chance to win another competition, a competition in collaboration with Azmalo.pk (www.azmalo.pk), an online shopping portal within Pakistan, selling electronics, books, toys and even fashion brands - How I love these eCommerce related ventures!! You will be winning a gorgeous 'Gypsy Love' 3 piece suit by Elan Lawn, modeled by the gorgeous Nargis Fakhri!!! 3) Tell us why you love designer lawn in less than a paragraph! You can comment on this post or on my facebook post!! The best answer will win the gorgeous Elan 3 piece suit featured in the picture. Competition closes on the 18th of March 2012 at 12 pm!! I love fashion because it is like an extension of my personality and what kind of mood I'm in. It can tell people to back off and leave me the hell alone, or it can invite people in and show the softer side of me. Fashion gives a certain amount of freedom to people and allows them to be who they want to be. I wear designer lawn to give a statement about what I wear from the head to toe. I'm covered in what I feel from in and out. From the vibrant colors to to well put together designs I know I can wear this with my head held high and shoulders back. I love designer lawn because it gives me the confidence to show my style. Hi girls, please make sure your full names are provided (same as what's on facebook) when you post the comments, so that I can find you on facebook when you win the competition!! I Love Designer Lawn because its something that Runs with the Most Latest Fashion, Style & Trend, Wearing Lawn is our traditional Clothing which is always In but the Designer Lawn is the Conclusion of Desi Elegance & Femininity which gives a Pleasure of Elegance & its Signature Represents a women of Creativity & Culture.Designer Lawn not not only having classy Features but also Highlighted the true Feminine soul. Scrumptious Prints, Highly Comfortable Fabric, Having Dual Looks of Stylish yet Desi Lawn. So all these reason's allows me to Love the Designer Lawn because everyone Loves to Look Beautiful & Wear the Crown of Beauty Queen. Every women of this world wants to Look More Beautiful & Charming, Designer Comes Up with the New Revolutionary Clothing that's called ' Designer Lawn ' ! For some people word ' LAWN ' is Casual but for me ' Designer Lawn ' is the Ideal Lawn because it contains all key factor which makes me look Simple yet very Beautiful so far, Not only this but its Heart-Touching Designs, New Rocking Style, Best Color Combinations, Eye Catching Prints makes this Lawn Truly Out of the box, No doubt it Groomed my Style & I must Say, It Gives Value for money. firstly,designer made lawn has new styles,prints,new colors combinations,eye catching designs,latest tech's are used in prints,they use very vibrant and trendy colors,secondly the designers r professional people with high knowledge about quality required for that specific season so they use excellent cloth quality,soft and comfortable cloth that should not stick to body in summers n that does not fade after single wash,thirdly the designs are for every age woman,a girl can wear a dress in a trendy way and a lady can wear same dress with great elegance,so i like designer lawn i trust them while spending my money. I Love Designer Lawn because its the perfect blend of traditional beauty, subtly enhanced by modern Design patterns and a sleek silhouette. The ethereal fabric and the sophisticated colour palette would look fantastic on our warm skin tones and the colourful border at the bottom gives it the trendy edge that makes the whole ensemble perfect for both young and old. The sparkling embellishments designs on the front & neckline also beautify the delicate lacy fabric and almost look like precious gem jewellery.Traditional chiffon dupatta with coloured accents would complete the Designer Lawn perfectly.That's why i ♥ LOVE ♥ Designer Lawn. love the designer suits cuz these r really chic having premium prints..the colours r fresh n presented a/c prevailing trends..prints r delicately made n added with embellishments..hence these provide the perfect way to fun,bold n trendy statements in hot summers..!! I Love Designer Lawn because of the beautiful traditional looks, modern prints and the exotic designs which are casual yet classy. Fresh floral, vintage and sleek silhouettes that manage to give an elegant and a look of pure perfection. The balance of colors and patterns complete my summer wardrobe. I love designer lawn because of the vibrant colors, exclusive designs and good quality of the fabric, but one major reason that always prompts me to go for designer lawn is that it saves you from all the hassle of desiging and buying of extra items for the embellishment of the lawn suits. The designers put in a lot of effort and provide their customers with different embroideries, extra fabric and what not which adds to the beauty of the dresses making designer lawn worth buying. lastly designer lawn dupattas are very beautiful, yet of a very good material( mostly chiffon) which adds to the overall effect of the lawn suit. when i buy designer lawn, i know i'm buying a product that is great value for money, and totally reliable quality wise - the colors wont bleed or fade, the material will be strong and yet light, perfect for Pakistani summers, the fabric will last for years without looking old, and the designs are unique and gorgeous!Designer lawn makes me feel and look like a million dollars! Each designer lawn is unique in itself and considering the magical touch that they bring to our everyday use lawn clothing, speaks for itself. Considering the long summers that we have in Pakistan lawn is a must have and owning a designer lawn adds vibrant touch to the wardrobe. Lastly, designer lawns are affordable in-comparison to other designer wear. I love designer lawns because the stuff is 95% worth it ! !!! thats wht makes them stand out from normal routine lawn suits. I like to wear a designer dresses but i cant wear it because of its expensive every people doesn't have a budget but to me i will satisfy my need to wear copies of these designer even though i know it copies but i like to wear at some how make me happy in anyways.. the colour of the dress is very vibrant look refreshes u to feel a summer a sun rays is not to harm u sweating doesn't feel u.. & saw every new design in market as par lawn competition all designers wants to be the best among all customer & make the hit of the season like the famous people do but tel u the truth this time elan comes wid a uniqueness of colours designs & specially to attract teenage to carry there personality..
it means elegant lawn available for every woman at affordable prices who wants to look like beautiful feel like beautiful nd wants to make her presence beautiful.. Designer dresses not only enhances but charms ur beauty wid trendy fashion wid superb quality which u can wear anywhere tht makes u confident classy woman nd develops ur personality..! That is one word that describes the Elan Lawn is" BEST". The much-awaited exhibition, quite literally took the city by storm — traffic choked all around the venue. The reason that i love designer lawn is that they are ALL IN ONE....ELAN Lawn prints are based on floral, oritental making the collection abduntaly verstaile..we can wear it in any kind of parties. six reasons to go with desinger lawns: 1) product QAULITY 2_ CONSISTENTCY 3) SELF IDENTITY 4) SOCIAL STATUS 5) CELEBRITY WEAR DESIGNERS CLOTHES 6) UNIQUENESS AND RARITY! that's all go with ELAN!!! I love designer lawn because every piece of clothing you wear represents a new idea that a creative mind, such as a designer's, created. They all are different yet equally exquisite. By representing those ideas, the lawn you wear also represents you and so there is always a different you. The texture lets you stay comfortable in your skin, the contrasts bring out the adventurous side of you and the quality of texture demonstrates elegance in you.